Ascending Butterfly: Bearpaw Bella Boot Giveaway! Ends 01/30! This giveaway is now CLOSED. Thanks so much to our wonderful sponsor BearPaw! We look forward to working with you again! The winner has been notified and upon confirmation, follower name will be posted both here and on our homepage. Remember: There are great giveaways active on the upper right hand side of the page! I have to admit I'm a bit late to this particular trend, when this 'comfy' boot craze began for some reason I didn't jump on the bandwagon. I never even tried a pair on! SAY WHAT???? I know RIGHT!?! I don't know why, I just never got around to trying them on. This winter Mother Nature has hit 'The Big Apple' with a vengeance. Apparently she's really mad at New York. Today the weather was an awful, miserable, icy, slippery MESS! I can't even sugar coat this one, it's UGLY out! Thankfully I didn't end up needing that sled or those Husky Dogs! And thats all thanks to Bearpaw! They sent me their Bella Boot about two weeks ago, and honestly I haven't taken them off since I received them. I now get that whole wearing them all day even as slippers thing! They are absolutely out the box comfy. They are that kind of comfortable that usually a shoe feels like right before you need to replace them. That perfectly broken in perfection! As you all know I don't have the easiest feet to shop for, high instep, lack of an arch for me the whole advice about shopping late afternoon for shoes is a must. And while I didn't have to brave the stores to shop for these, I can tell you honestly, that I would have gladly, they are literally that comfy! And now I want one in every color! Bella, The Boot, Not the Twilight Character! Ƹ̵̡Ӝ̵̨̄Ʒ - Comfort! These boots are super comfortable, they stand up to the cold and wind, and keep you warm, without being heavy. You can walk comfortable and not feel like you are walking in molasses or tar. They are so comfortable you just want to move, move, move! Ƹ̵̡Ӝ̵̨̄Ʒ - Warm! These are everything you want in a boot, toasty, but not so over heated hot that as soon as you get indoors again you want to take them off. I've experienced boots where when I get into the bus or train I'd get so hot with them on I just wanted them off, but would have to wait until I got to the office. These are perfect. I honestly regret not getting into this trend sooner, but I can tell you I am now totally spoiled! Ƹ̵̡Ӝ̵̨̄Ʒ - There is only one major con I now want one in EVERY color, and I do mean every color! So usually I like to set trends and not follow them, but in this case I happily make an exception! Despite Mother's Nature's Best, I braved the storm, and had a great hair day too, more on that to come! Ƹ̵̡Ӝ̵̨̄Ʒ - WIN IT! - Ascending Butterfly and our friends at Bearpaw want you to win a pair of Bella's too! (You can have the Bella in any color except the Eggplant I received due to availability) . 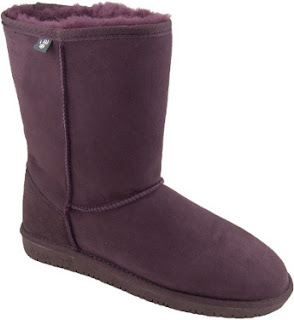 Don't you just ♥ Bearpaw? I know I do! (2) MANDATORY entry- Visit our friends at Bearpaw and LINK us to another pair of boots that they sell that catches your eye! REMEMBER: You CANNOT post a link to the Bella Boot or the entry will be disqualified. Ƹ̵̡Ӝ̵̨̄Ʒ - Did you know that Bearpaw has an online magazine? In addition to their Facebook and Twitter Stream, exclusive promotions will also be published here, you really should subscribe to you can be in the know! I beleive you'll be very happy you did. Subscribe to the magazine using the orange subscribe button on the top of the page HERE! I like bearpaw on facebook. I am following Ascending Butterfly on Networked Blogs. br0wnieluver [at] hotmail [dot] com <---please contact me this way if I happen to win. I forgot to post this in my first entry. Sorry. I own them and their great. Would love to win these for my Mama. Thanks for the great giveaway! I love Bearpaw boots and the Bellas are at the top of my wishlist. I also love the Abigail style http://shop.bearpawshoes.com/women/boots/abigail-8-womens_827003.html both for me and my toddler daughter! So cute! My email is knyus2004 at yahoo dot com. I am glad to have found this blog and this great giveaway!!! I like the Altai in Black or Chocolate. I love these! They are so me! I follow with GFC as Totally Temberton. I like you on FB as Cara R.
http://twitter.com/#!/lindaturner51/status/27924023362981888 I'm following you on twitter. I'm following @BearPawShoes on Twitter. I'm following your Blog on Networked Blogs. I follow Tracy_Iglesias on twitter! I like Bearpaws on facebook! I follow you on Netwrked Blogs! I follow @bearpawshoes on Twitter (@CKhalaj). I subscribed to Bearpaw's Online Magazine (catalina khalaj). I "like" Bearpawshoes on Facebook (catalina khalaj). I entered your Marissa Del Rosario Prairie Tote Giveaway. I Like BEARPAWshoes on Facebook - Lorrie R.
I entered the Marissa Del Rosario's Prairie Tote in Kaffir Giveaway! I added a comment on your wordless Wednesday post.